Hallo! Mike Sauter here. Although 7" single picture sleeves are by now a faded art form, there are many delightful examples of bands who tried to give their fans something more than just simply the music when they purchased singles. XTC usually went the extra mile for their 7" releases, and for some, they went many extra metaphorical miles. Because of this effort by the band, and because of my fondness for their music, I started collecting their picture sleeve singles back in the 1980s. I don't have a complete set, but here on the occasion of Andy Partridge's 60th birthday on Monday, I brought a bunch of them in to WYEP to share with you. Here's a fairly basic one to start off. It's the single sleeve for "Senses Working Overtime" from 1982's English Settlement album. Nice if straightforward art illustrating the five senses. (click on this or any of the images below for a larger version) Another simple one, "Wake Up" from The Big Express from 1984. Just a sleepy man's head recast as an alarm clock. Here's the sleeve from the 1980 single "Sgt. Rock (Is Going to Help Me)." The song is about a lovelorn guy envisioning comic-book tough guy Sgt. Rock helping him get and keep a girlfriend, so the art depicts a nebbishy guy following in the footsteps of a huge brute (the style seems patterned after Mad Magazine's Don Martin), with an arrow leading the reader towards the back of the sleeve.... ...and on the back, there's simply an explosion, suggesting that following in the Sergeant's footsteps didn't end very well. The 1984 single "This World Over" is a Cold War nightmare, depicting life on earth following a nuclear war. Hence, the elaborate artwork with a series of postcards attached to the front of the single. Each postcard is captioned as an image of different major world cities ("Greetings from London," "Greetings from New York," etc.) but all of the show the identical bombed-out, destroyed landscape. The postcards attach to the single sleeve at an image of a button labeled "Push Once." Here's another angle on the unfolded postcards. This is a detail of one of the postcards. 1982's "No Thugs in Our House" is another elaborate sleeve design. Here's the way it appears flat from the front. Note the bottom is labeled "XTC Theater." The sleeve has a flap which can unfold, revealing a proscenium arch lifting off a setting for the song's storyline. In keeping with the the song's refrain that "And all the while Graham slept on, dreaming of a world where he could do just what he wanted to," at the top is the sleeping Graham. The kitchen window is a cutout showing a landscape printed on the single's record label. The single also comes with cutout characters so that one could act out the song behind the proscenium arch flap. Characters include Graham's moother (the "insect-headed worker wife"), the young policeman, and Graham's father (later revealed to be a judge). Finally, the back of the single has its lyrics written out as if a theatrical libretto. Another picture of the single with all its parts: "Ball and Chain" was another single from the same album as "No Thugs in Our House," 1982's English Settlement. The sleeve for "Ball and Chain" was simply designed, but obviously made to emulate classic '60s record sleeves. For comparison, here is a link to an image of the back of The Beatles' U.K. 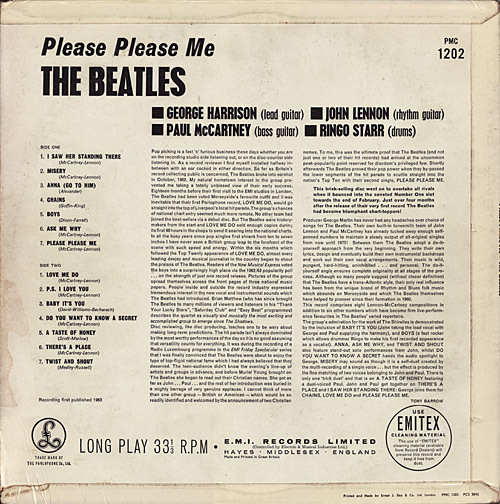 Please Please Me LP. This is a detail of the "Ball and Chain" sleeve back, with a parody ad for "XETIC" record cleaner. 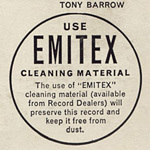 Compare this to EMI's ad on the back of Please Please Me for "Emitex" record cleaner. The sleeve for the 1986 single "Dear God" is as striking and controversial as the song itself. 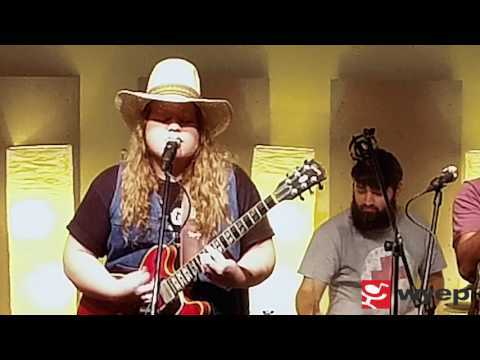 The song's lyrics, framed as a message to God, questions the rationale for a belief in God and finally proclaims, "If there's one thing I don't believe in, it's you." Thus, the single's cover image of a pen substituting for a crucifixion nail both reinforces and comments upon the song's theme in an unforgettable manner. "Dear God" denial of belief aside, XTC issued a 1983 Christmas single under the psuedonymous band name "The Three Wise Men." Neither "XTC" nor any of the band member's name appeared anywhere on the single, but the sweetly melodic music on "Thanks for Christmas" is pure XTC pop. Here's the cover with the members of XTC is heavy disguise as the biblical Wise Men. The back cover shows them all bearing their gifts. Here's a detail of the book carried by the middle Wise Man, titled "What's On in Bethlehem." Finally, here is the sleeve for 1989's "The Mayor of Simpleton." It's a painting on wood depicting, presumably, the titular mayor and the Simpleton landscape over which he administers. The wood is riddled, for some reason, with holes. The back cover of the sleeve shows what appears to be the back of the wood (featuring the same holes) painting with a Simpleton-set depiction of the members of XTC. Andy Partridge is the bespectacled one bearing the guitar. Well, that's it for this tour of some of XTC's 7" picture sleeves. Hope you enjoyed it. And happy 60th birthday, Mr. Partridge! Cool stuff - I'd never seen "This World Over", that is pretty crazy. I have Nigel and All You Pretty Girls but they're just sleeves.